Unsettling Chapters: Where Are You Going, Where Have You Been? Nearly a half-century since its publishing in 1966, this remains the most disturbing story I’ve ever read. I was introduced to “Where Are You Going…” in college, where it was read aloud by our English teacher, and my former employer, Julie Papadimas. What I remember most is gripping the side of my desk, trying to keep from screaming at Connie. This is as visceral a reaction I’ve ever had to a work of fiction. I wasn’t just affected by this story. I was pissed. I felt sick. I wanted to dive into the pages and lock the front door. Though a lot of readers, I’m sure, are familiar with the ending, I don’t want to spoil it for anyone who hasn’t read it. I will only say that halfway through the story, it dawned on me just how it had to end. You feel the bile rising in your throat, yet there’s no looking away. There’s no putting it down. There is only the suffocating gaze of Arnold Friend and his sociopathic schmooze. This is not a trick-or-treat brand of spooky, but the essence of true fear. The rare story that forces the reader to accept their vulnerabilities and realize that we can’t always protect the ones we love. Can we even save ourselves? 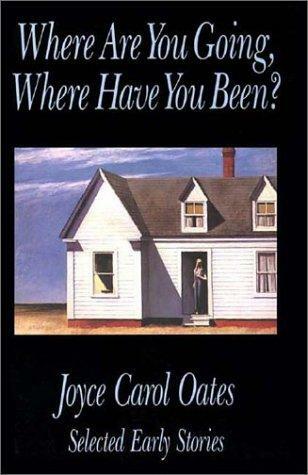 “Where Are You Going, Where Have You Been?” unnerves me in a way similar to Flannery O’Connor. It’s fiction that replicates that moment on a roller coaster when the train is briefly suspended at the top, about to descend, but seemingly frozen in place. When you feel the bottom drop underneath, but you have yet to tumble after. The breathless space where time knots into an excruciating paralysis. This is the way Oates entwines and consumes us. With the patient grace of a constrictor. And her grip has yet to slack. I pray that it never does. And finally, for a Halloween treat, you can read (or re-read) “Where Are You Going, Where Have You Been?” at the University of San Francisco’s Web site. …And sadly, that brings us to the end of our 31 Days of Dread series. Tomorrow, like a post-rampage Hulk, we will return to our proper form as Ensuing Chapters, where we’ll produce a monthly column for Transgress Magazine and write semi-weekly blog posts. Thanks for reading. If you have any suggestions for disturbing books or stories we may have missed, please send them along. We’re always looking for a new unsettling read… and we’ve got 11 months to kill until next October.